LVMC Holdings, the local dealer of Hyundai Motor in Myanmar, on Friday held an opening ceremony for a automobile knockdown factory in an industrial zone in Yangon, Myanmar’s economic capital. The assembly plant – owned fully by LVMC Holdings and managed by production corporation Shwe Daehan Motors – is capable of churning out 10,000 cars annually. Hyundai Motor’s 1.4-liter compact vehicle Accent will be produced at the plant with their sale to be launched this month. The ceremony was attended by U Phyo Min Thein, chief minister of Yangon, Jeong Bang-sun, vice president of Asia-Pacific, Africa & Middle East Operation division at Hyundai Motor, Oh Sei-young, chairman of LVMC Holdings, and Lee Sang-hwa, Korean ambassador to Myanmar. LVMC Holdings is a company founded by Korean entrepreneur Oh Sei-young in Laos in 1997. It is the largest private company in Laos engaged in not only the production and manufacturing of automobiles and motorcycles but also finance, construction and logistics businesses. 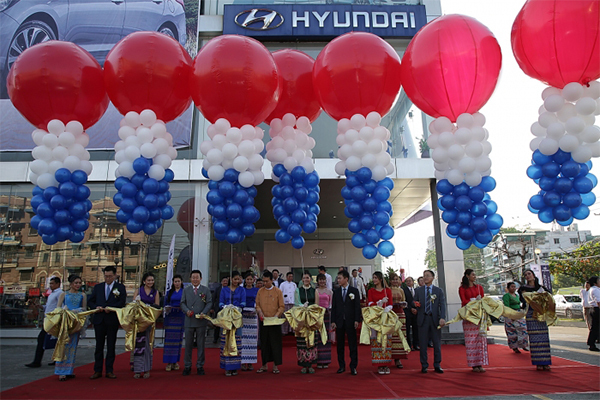 LVMC Holdings in Myanmar has focused on expanding sales of Hyundai Motor vehicles since 2013 when it signed a dealership agreement with the top Korean automaker and built a large-scale showroom in Yangon. The Laos-based company also started producing its own truck brand Daehan Motors to become the second-largest industry player in Laos in just three years. LVMC Holdings’ move to build an auto assembly plant in Myanmar for Hyundai Motor comes amid growing demand for locally-built vehicles and changing business environment. In 2013, the Myanmar government eased regulations on auto imports and opened up its market. Despite the changes, the country’s regulations and import duties had remained stricter and higher compared to those in other countries, allowing imports of mostly used foreign vehicles. More than 100,000 units of used vehicles arrived in Myanmar every year while only 5,000 new cars. In 2017, however, the Myanmar government introduced tighter regulations on used cars in terms of model year and pledged striking tax benefits on locally manufactured cars in a bid to lure auto companies to build manufacturing facilities in the country.